Computer Power and Legal Language explores the central issues involved in the use of computers to conduct legal business. The contributors, all experts in their field, take as their starting point fundamental questions about the potential utility of computational models of linguistics, intelligence, and logic in the law: Is it possible to use computing to communicate in the manner legal experts do? Can legal language be represented in computational form? How does natural language serve as both a bridge and a major stumbling block for the communication of concepts--both among jurists and computers? In answering these and other questions regarding computers in the law, the contributors present the results of research on the cutting edge of legal informatics, expert systems, and legal language, and they introduce important new applications of computers for lawyers. Walter begins with an introductory chapter on the ways language is used in law. 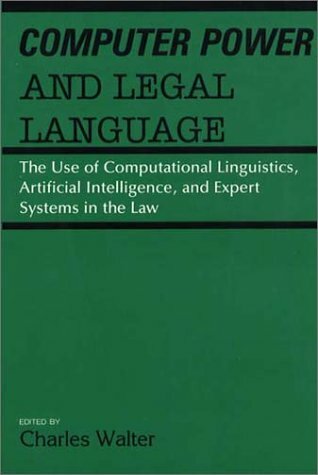 Subsequent chapters address a wide range of concerns: the relationship between precision in meaning and open texture in legal writing; the application of logic programming to law; a semantic representation of pre-contractual and contractual verbs of exchange; the use of CCLIPS, a computer program that reads and understands the Louisiana civil code; the interface between human users and legal information retrieval systems; and more. A state-of-the-art contribution to current research in the field, this book offers a much-needed synthesis of current theory and practice regarding computers and legal language. View More In Business Technology.